Original publication date: Thursday May 29, 2003. Image courtesy U.S. Department of Energy's Brookhaven National Laboratory. Scientists from the U.S. Department of Energy's (DOE) Brookhaven National Laboratory and Argonne National Laboratory have received U.S. patent number 6,528,948 for a device that shuts off airflow into a vacuum about one million times faster than mechanical valves or shutters that are currently in use. The new device, called a plasma valve, was developed through research funded by DOE’s Office of Basic Energy Sciences in the Office of Science. In synchrotron light sources, other particle accelerators, and various other scientific instruments, where plasma valves can be put to use, a vacuum allows very high-energy electron beams to circulate in rings for hours. These electron beams interact with magnetic fields to generate x-rays, ultraviolet light, and other forms of radiation that travel unimpeded through beam lines used for experiments. When the vacuum is breached, air moves in with great force, the electron beam loses confinement, and its energy is deposited on vacuum walls. The faster the breach can be contained, the less damage there will be to the ring, beam lines, and the experiments that use those beam lines. The need for a fast valve at Argonne’s Advanced Photon Source led Argonne engineers to explore the potential use of plasma arcs previously developed for electron welding guns. The Argonne team — Sushil Sharma, John Noonan, Elbio Rotela, and Ali Khounsary — joined Ady Hershcovitch from Brookhaven to develop the plasma valve. When activated, the plasma valve is composed of an ionized gas, or a gas with charged particles confined by electric and magnetic fields, that fills an airtight aperture. When the plasma reaches certain temperature and density parameters, it separates atmospheric pressure from a vacuum, which must be devoid of pressure. 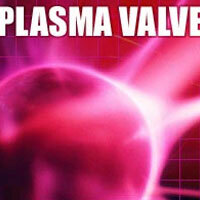 When a vacuum is breached, a plasma arc is ignited in less than one nanosecond inside the plasma valve. The valve's outer structure is comprised of a hollow, water-cooled copper cylinder located between three cathodes and a hollow anode ring at the opposite end of the cylinder. At 15,000 degrees Celsius (27,032 degrees Fahrenheit), the plasma valve is about 50 times hotter than room temperature when measured in degrees Kelvin. This intense heat makes the ionized atoms and molecules move around and collide with air molecules so rapidly that the ions block any air molecules that might pass through the plasma valve. Researchers from around the world study a wide variety of materials at light sources such as the Advanced Photon Source at Argonne and the National Synchrotron Light Source at Brookhaven. For example, they use their bright beams of light to examine the minute details of computer chips to make more efficient computers, decipher the structures of viruses to work on developing new pharmaceuticals, investigate magnetic materials to make better recording devices, and study corrosion to develop new methods for its prevention.